September 2014 the Audubon Society launched their climate change campaign with a most remarkable assertion: 314 of 588 bird species are “on the brink” and “will lose 50 percent or more of their current ranges by 2080” due to rising CO2. Avid birder and renowned author Jonathan Franzen shared his resentment of these claims in a recent New Yorker article arguing that focusing on futuristic effects of climate change distracts conservationists from dealing with more immediate problems that can be more readily dealt with. Others were dubious of the hype because many of Audubon’s “climate endangered” species have been enjoying increasing population trends such as the recovering Bald Eagle. While Audubon contends that their provisional scenarios will help future conservation efforts, others have whispered that such an apocalyptic media campaign smacks of a crass fundraising gimmick that relies on dubious models and naive fears. Are Audubon’s models so reliable they can justify hyping catastrophic conclusions? Will “Audubon science” promote better environmental stewardship? Or, are their projections just another example of misplaced alarmism that has also obscured the critical issues facing butterflies, polar bears, emperor penguins, golden toad, pika or moose. Although we cannot ascertain Audubon’s intent, nor scientifically validate their projections for 2080, we can examine the skill of their models and the trustworthiness of their predictions. This essay illustrates the tremendous uncertainty of Audubon’s models and highlights some of the current research that presently contradicts Audubon’s predictions. Models that provide Pervasive Inadequate Generalizations are PIGs, and PIGs never provide reliable guidelines for wise environmental stewardship. The technical report behind Audubon’s apocalyptic media blitz simply merged Bioclimatic Envelope Models and downscaled Global Climate Models, and both models have been severely challenged within and without the scientific community. Bioclimatic envelope models circumscribe the range of temperatures and precipitation that are deemed suitable for an individual species. BEMs are typically not determined by experimentally evaluating the species tolerances for any given range of temperatures and precipitation. 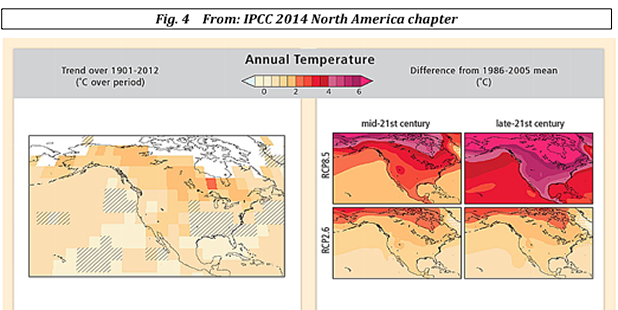 BEMs simply correlate the temperatures and precipitation within a species’ current range. The major flaw in these models is the assumption that a species current range is limited solely by those climatic factors and the species is currently in equilibrium with those factors. But the availability of resources and competition with other species will also limit a species range. Landscape changes and overhunting have reduced many species’ range so that their current boundaries may only represent a fraction of what is climatically suitable. For example, over a century ago the Greater Prairie Chicken ranged from southern Texas to North Dakota. Historically its climatic envelope encompassed a wide range of temperatures (both light and dark green in map below). However due to extensive hunting and habitat loss it was extirpated from most of its historic range (light green). A bioclimatic envelope based only on temperatures in its current range (dark green) would suggest the Greater Prairie Chicken depends on cooler temperatures of the northern Great Plains. 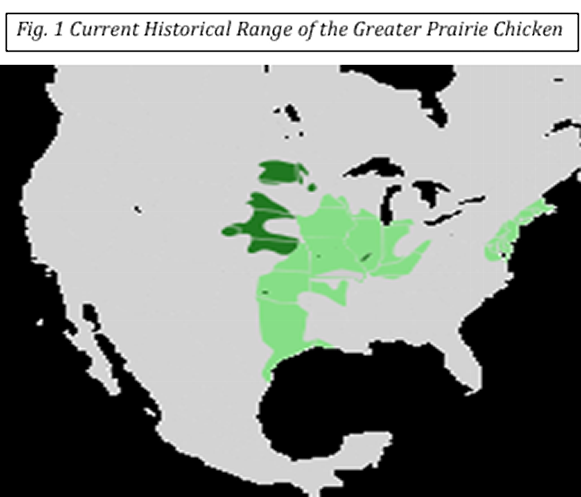 But whether natural or man?made factors raise temperatures 1-2 degrees by 2080, those temperatures would still be within the historical range experienced by Greater Prairie Chicken that once thrived in the southern end of its range. BEMs assume each species genetically conserves its reliance on a specified climate niche over millennia. For that reason we believe species contracted their ranges towards the equator (or persisted in unique climate refugia) during the last ice age. Conversely, we must likewise assume birds expanded their ranges pole?ward 6000 years ago during the Holocene Optimum when Northern hemisphere temperatures were 1° to 6°C warmer than today. 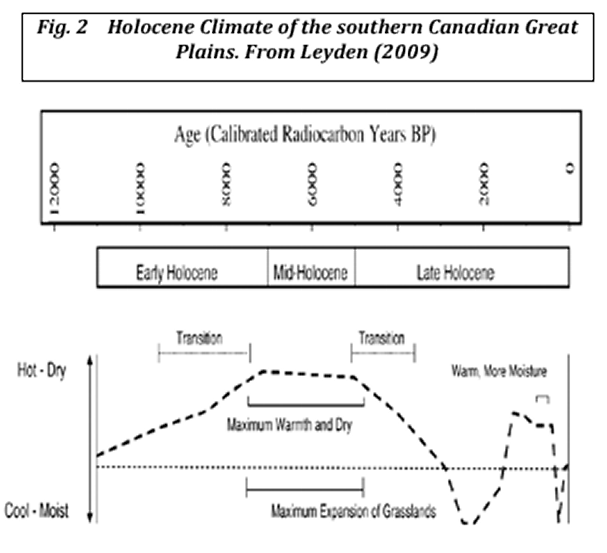 Typical for most of the northern hemisphere, multi?proxy evidence suggests the Great Plains were much warmer than today for most of the mid?Holocene (Fig. 2). Whether man-made of natural, if future warming pushes species pole?ward, would it be catastrophic as Audubon suggests? Or would species simply re?colonize habitat that was lost due to the Little Ice Age between 1300 and 1850 AD? The only reason species of the Great Plains would not re?colonize the prolific grasslands of the Holocene Optimum, would have nothing to do with the current climate. It has everything to do with fire suppression and the loss of over 90% of the grasslands in most regions to agriculture and development. BEMs are not determined by a species’ physiological limits. Indeed those limits have never been determined for most species. In addition, given that many species are confined to unique habitat and plant associations, a species’ current range is in large part limited by the climatic boundaries of its preferred vegetation (i.e. grasslands, forests, wetlands, etc.). This is why the consensus among conservation biologists is habitat loss has been the greatest threat to birds. So it is highly likely that the ranges and abundance of bird species expanded and contracted in concert with expanding plant species during the Holocene. Just as Holocen warming benefitted grassland expansion, 9000 years ago tree line expanded to the shores of the Arctic Ocean, 100s of kilometers further north than observed today. In California researchers report that Sierra Nevada tree line was at higher elevations for most of the past 3500 years, but was pushed to lower elevations during the Little Ice Age. In some regions of Eurasia’s Ural Mountains, the cold of the Little Ice Age prevented any new trees from spouting for hundreds of years. The current warming that began 150 years ago has enabled a more productive forest ecosystem, so we can infer this warming has also been beneficial for bird species of the forest. Nonetheless, even if BEMs could fully determine the historical range of a species’ suitable macro?climates over millennia, BEMs cannot predict how birds will exploit the varied habitats and micro-climates within that range. Paleontologists are increasingly finding “enclaves of benign environmental conditions within an inhospitable regional climate” that allowed species to persist during the Last Glacial Maximum. I have measured micro?climates within just a 100?meter radius. Temperatures along a gravelly roadside were 20° to 30°F higher relative to the forested area, and 10° to 15° F warmer than grassy and shrubby areas. In addition to those vegetation effects, varied topography creates a similar wide array of microclimates between north?facing and south?facing slopes. As daily temperatures fluctuate by 20° to 30°F, birds can easily exploit a wide variety of micro?climates. It is likely this great variety of microclimates explains the complex range shifts that are not predicted by “Audubon science” and why so many species have not shifted their range at all over the past century. It also highlights a mechanism that will allow species to persist in their current habitat despite Audubon’s models. 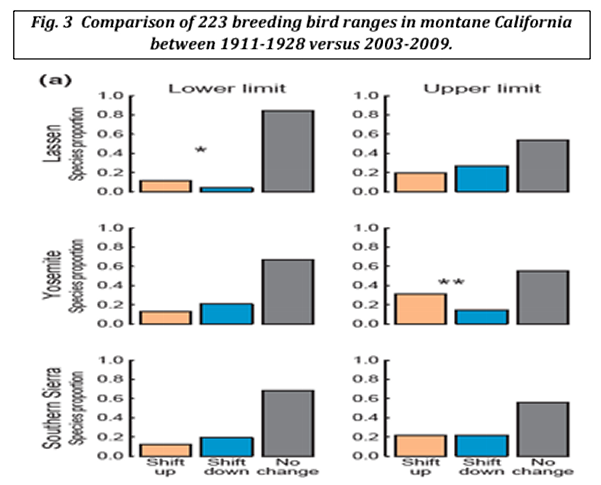 Recent surveys of birds in montane California report that the elevation ranges of 223 breeding species identified a century ago have not altered either their upper or lower range limits. For those species that did shift their range, just as many species moved down?slope as up?slope (Fig, 3). Again the difference appears to be more a function micro-habitats than an individual species response to global climate change. Of 53 species that were common to all 3 transects, (Lassen National Park, Yosemite and Southern California), only 5 species shifted their range in a similar manner. For 91% of the species, one population moved upslope in one region, another moved down?slope or did not shift at all. Furthermore for those species that moved upslope, increased warmth was unlikely to have been the driving factor. Researchers reported that “although the northern (Lassen) region barely warmed on average over the last century, showing localized areas of marginal warming and cooling, the proportion of bird species shifting there was comparable to the other two regions that experienced substantial warming.” Such results again argue that BEMs have very little skill predicting how species’ range will shift. It also suggests Audubon’s woeful predictions of 341 species “on the brink” are at best unsupported premature speculation. In contrast to Audubon’s press releases touting modeled results predicting Maryland’s state bird, the Baltimore oriole, would soon be pushed northward and out of the state by global warming, instrumental data suggests no such change. 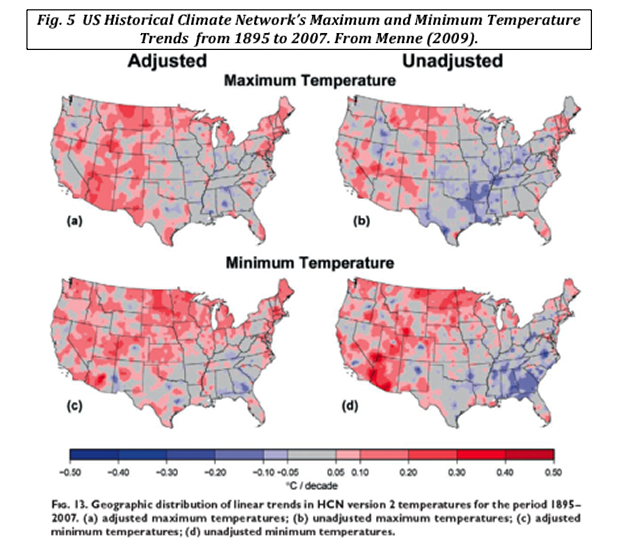 Instrumental records highlight a century long cooling trend in the southeastern USA (Fig. 5), a region that climate researchers refer to as a “warming hole”. Additionally the brutal winters and record low temperatures for the past few years further stand in stark contrast to Audubon’s simulations that project increasing warmth and northward shifting wintering and breeding grounds. Those cooling trends do not refute the hypothesis of a warming contribution from rising CO2, but do demonstrate how greatly regional temperatures can depart from global climate projections due to natural dynamics. It also suggests Audubon’s climate science contributes precious little to bird conservation. I would add we are also unlikely to diagnose climate impacts using just regional average temperatures. The “average” temperatures in California have assuredly increased since the Little Ice Age, but the average has been driven by rising minimum temperatures, which are typically driven by land use changes and urbanization effects. While rising minimum temperatures may impact the rate of snowmelt, rising minimums do not significantly contribute to heat stress. 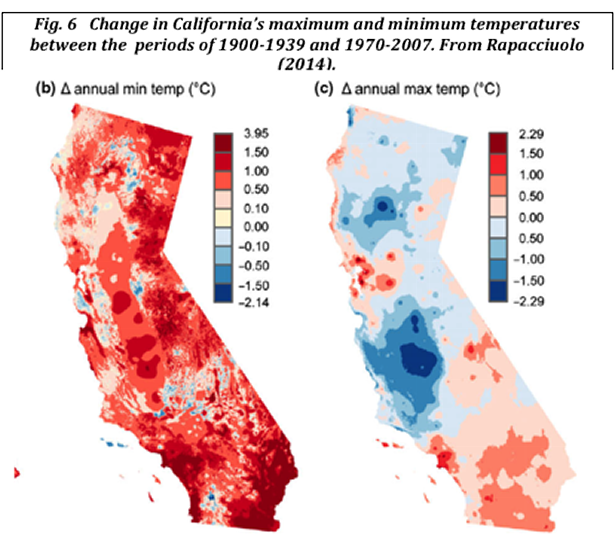 Only maximum temperatures exert heat stress on plants and wildlife, and compared to the 1900-1939 period, maximum temperatures have declined over most of California (Fig. 6). IPCC climate models failed to predict these regional cooling trends, in part, because IPCC models run hot and overestimate maximum temperatures. Although these cooling trends do not refute the warming potential of rising CO2, these cooling trends again demonstrate that natural climate variability can oppose CO2 warming and dominate surface temperature trends. Allen’s hummingbird is an excellent example that demonstrates the failure of “Audubon science” when it combines a bad species BEM with an inadequate climate generalizations. Audubon science predicts the Allen’s hummingbird will lose 90 percent of its current breeding range as global warming shifts breeding habitat northward. But as I watch these hummingbirds flit through my backyard, I know that such a loss will only happen when PIGs fly. In reality maximum temperatures have been cooling throughout most of their range. Second, there are 2 subspecies of Allen's hummingbird; one is migratory, and the other is a non-migratory permanent resident on the Channel Islands off southern California. As noted in Wikipedia, the non-migratory population dispersed to the mainland and colonized the Palos Verdes Peninsula of Los Angeles County in the 1960s. Since that time the subspecies has spread over much of Los Angeles and Orange Counties, spreading south through San Diego County. This southward expansion of breeding habitat towards the warmer regions is the exact opposite of Audubon’s behavioral predictions. The migratory subspecies’ breeding habitat is generally restricted to California’s coastal fog belt and extends just into southern Oregon. 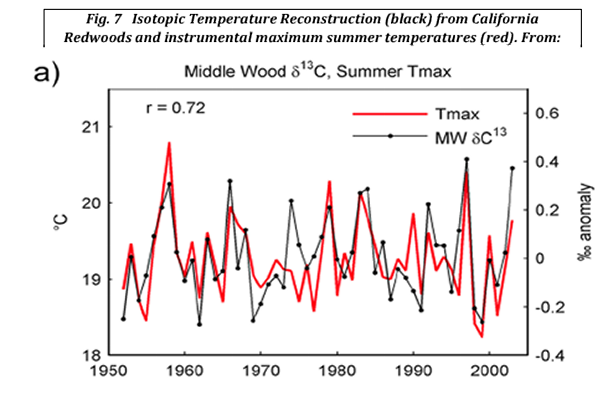 Although there was a slight warming along California’s northern coast since the end of the Little Ice Age, there has been no warming trend its prime?breeding habitat since 1950’s as observed in both instrumental data and isotope analyses of redwood tree rings (Fig. 7). Again there is no evidence to support Audubon’s dire predictions. So why is Audubon straying from habitat preservation issues to hype unlikely dire predictions that will more than likely give Audubon a black eye? As Franzen noted, climate change is a “ready-made meme, it’s usefully imponderable” and that is well understood by Audubon’s new president and CEO David Yarnold. Yarnold was not hired for his scientific expertise. He is a journalist. Before Audubon, he helped the Environmental Defense Fund double their revenues by pushing a climate change campaign, so it is no surprise that he is repeating those efforts for Audubon. But the new climate agenda seems more than a fundraising campaign. There is a definite political agenda. This week Audubon launched a new social media campaign #ClimateThing. The tactic appears to be less about protecting birds, but about perpetuating a meme that blames everything from the war in Syria to prostitution to stray kittens on rising CO2. We are constantly bombarded with media hype that everything we love is threatened by climate change. Hijacking the real conservation issues that face birds is just another example to be used as a political hammer. So I suggest skeptics respond. Go on to twitter and tell Audubon your #ClimateThing demands better science, not fear mongering. Tweet David Yarnold (@david_yarnold) and tell him to get real and stop hijacking the sincere concerns of so many of its members. Reply to tweets and link to the analysis here or on my website and ask for explanations to why “Audubon science” diverges so far from reality. Ask how lowering CO2 concentrations will reclaim lost grasslands or restore watersheds that are so critical to birds. Ask how lowering CO2 will protect the truly endangered species on islands because human introduced rats, cats and stoats against which these birds have no defense. Audubon and real conservation are now added to my list of casualties inflicted by the politics of climate change.